Whenever we visit Lucban, Salud’s halo-halo, sidewalk habhab sold beside the church, and the garlicky longganisa are always on our list. So for this Pahiyas Festival, no matter how crowded the streets and the stores were, we found our way to our Lucban comfort foods. 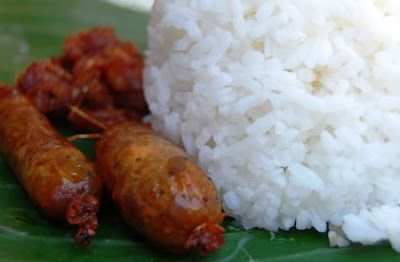 Upon our arrival, tired and hungry from our motorcycle ride, we had Lucban longganisa our late breakfast. I don’t why the longganisa cooked at Lucban is different from those cooked at home. Hmmm... I need to discover the secret of cooking it the Lucbanses way. Then we strolled around to marvel the houses with Pahiyas ornaments. We also got the chance to see the parade of beauties, the floats, and other street celebrations. After an hour, I asked hubby for something to quench our thirst. Aha! He said, just the right time for halo-halo. So we walked towards Salud Refreshment and indulged in unique halo-halo de Salud. After the halo-halo, we continued our stroll. 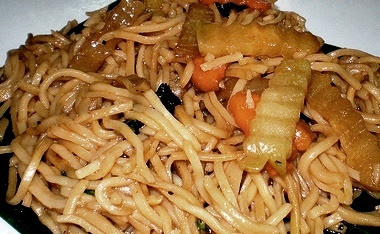 We also checked our pansit habhab suki beside the church. But unfortunately, her kariton is nowhere to be found. Maybe because of the fiesta, she changed her spot, so we just grabbed the next habhab kariton at sight. Just like the longganisa, the taste was far different from my home cooking... Hmmm... so I have two secret to unravel, the Lucbanses cooking of longganisa and pansit habhab.